This extremely interesting and educational DVD is perfect for lovers of documentaries or British history and tells how the very future of this monarchy was threatened until Princess Alexandrina Victoria was born in 1819. Cleverly groomed to become the next Queen of England, The British Empire was about to enter another Golden Age. Of course, Queen Victoria was not the only influential person in British Imperialism at this time and this documentary goes into great detail about William Gladstone, Benjamin Disraeli, David Livingstone, Rhodes and her husband, Prince Albert. The first episode begins with the birth of Queen Victoria and how her arrival changed the face of Britain from an agrarian society to one of the forefathers of the industrial revolutions. As the citizens of England began to flock to the cities for work and housing, Queen Victoria focused on her loyal people, whereas her advisors such as Prince Albert, Benjamin Disraeli and William Gladstone started the British invasion abroad. Episode two targets the British invasion and how the majority of the world’s industrial goods were made in Britain. It also delves into the colonisation of India which ignited the Great Mutiny in this country and caused the death of many. With a clash of Victorian England values and the traditions of India, this would be the first thorn in England’s side. This was also the time of the death of Prince Albert which would have repercussions for Queen Victoria. Episode 3 focuses on the relationship between Queen Victoria and her deceased husband which has weakened the monarchy. It highlights the explorations of David Livingstone in Africa and how Disraeli and Gladstone fought for control over the British government. In terms of the industrial revolution, it gives the viewer a great insight into how England got a foothold into the Middle East that would begin the exploitation of Egypt. Lastly, episode 4 showcases the problems of England controlling their vast empire with Queen Victoria celebrating her Diamond Jubilee. Unfortunately for the British Empire, this is where the cracks of the empire start to become apparent with the onset of the Boer War and eventually, the death of Queen Victoria which ended her rein 64-year reign. As you can see, Empires Queen Victoria's Empire is quite a varied and an educational documentary into the reign of this powerful Queen and how England recommenced its colonisation by becoming a true powerhouse in the industrial revolution. 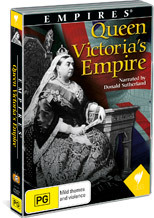 Empires Queen Victoria's Empire is an extremely well made, researched and interesting DVD that features good video and audio quality which nicely compliments the politically engaging historical facts.